Old Man at the Bridge by Ernest Hemingway is a short story staged against war-torn Spain. The time is of Spanish Civil War, around Second World War. Like in many other short stories of Hemingway, death during war time is prominent in this story as well. A soldier passes by an old bridge to go back to a village to see whether the enemy army is following his army or not? The Spanish Civil War was fought between Fascist and Republican. The soldier is from Republican Party. While crossing the bridge, the soldier notices many people crossing the bridge, in fact fleeing the village because of ensuing war. 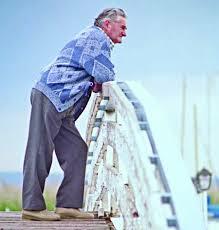 He spots an old man sitting by the road on the bridge. When the soldier comes back, he finds the old man still there, whereas all people have left the place. The old man is lonely, dusty, and tired. Seeing the miserable state of the old man, the soldier initiates conversation with him. The old man says that he is the last man to leave his village because he cares for his animals that consists of pigeons, cats, and goats. He is of the opinion that death is inevitable for his cattle and him. Though he expresses gladly that cats are intelligent to escape the wrath of approaching army, but pigeons and goats look bleak. The old many says that he is seventy-six years old and has already walked for twelve miles. And now he is too tired to walk further. Upon asking his political inclination, the old man reports that he is a simple man with no political side favouring. The soldier encourages him to walk some distance so that he can catch a truck for Barcelona. The old man denies as he knows no one there. The soldier looks up at the overcast sky and forms conclusion that today there will not be any air raids, thus the old man is considerably safe for the day. However, deep at this heart, he is firm that the old man is waiting to embrace his death. It is ironical to note that during war, people run here and there for life, but this old man is rather waiting to die after all. Why? The answer is to get rid of war misery. Loved reading this story, try reading The Old Man and The Sea.